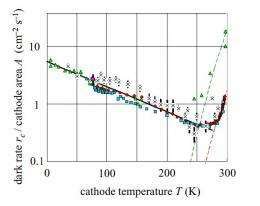 In cryogenic electron emission, at first as temperature decreases, the dark rate decreases. But at about 220 K, the dark rate levels off, and with further cooling, it begins rising again. Image credit: Meyer. (PhysOrg.com) -- At very cold temperatures, in the absence of light, a photomultiplier will spontaneously emit single electrons. The phenomenon, which is called "cryogenic electron emission," was first observed nearly 50 years ago. Although scientists know of a few causes for electron emission without light (also called the dark rate) - including heat, an electric field, and ionizing radiation - none of these can account for cryogenic emission. Usually, physicists consider these dark electron events undesirable, since the purpose of a photomultiplier is to detect photons by producing respective electrons as a result of the photoelectric effect. In a recent study, Hans-Otto Meyer, a physics professor at Indiana University, has further investigated cryogenic electron emission by performing experiments that show how the electron firings are distributed in time. His results reveal that electrons are emitted in bursts that occur randomly, although within a burst the electrons are emitted in a peculiar, correlated way. He suggests that the correlations indicate some kind of trapping mechanism, but the unusual behavior is inconsistent with any spontaneous emission processes currently known. At least at the moment, there seems to be no physics explanation of the observations. In his experiments, Meyer placed a photomultiplier inside an empty container, which he then submerged in liquid nitrogen or helium. Using radiation cooling, he cooled the photomultiplier to a temperature of 80 K (-193° C) after about one day, and to 4 K (-269° C) in another day. With this setup, he could detect cryogenic dark events, which are shown to be caused by single electrons emitted from the cathode of the photomultiplier. As previous research has shown, starting from room temperature, the dark rate decreases as temperature decreases, but only up to a point. Below about 220 K (-53° C), the dark rate levels off. With further cooling, it begins to rise, and continues to increase at least down to 4 K (-269° C), the lowest temperature for which Meyer has data. Most of Meyer’s experiments were performed at around 80 K (-193° C). Electrons are emitted in bursts that last for different lengths of time, with their duration distribution following a power law. Image credit: Meyer. Perhaps this last observation of progressively longer intervals between firing events within a burst is the most interesting. Meyer suggests that this peculiar distribution of events could be the result of a trapping mechanism. If caught in a trap, an electron could either exit the trap (to be observed as a dark event) or it could recombine with an electron hole. When a trap of electrons is emptied, the emission rate would be proportional to the number of electrons remaining in the trap. This scenario could possibly explain the initial gush of events in a burst, followed by a few remainders that trickle out. In agreement with previous observations of correlations between temperature and dark rate, the electron emission rates in Meyer’s experiments were also affected by temperature. 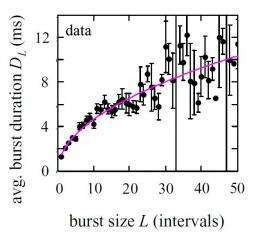 As the temperature decreased, both the rate of bursts and the number of events per burst increased. This observation that emission rate grows with decreasing temperature fits well with the trap hypothesis, in which it would be the consequence of recombination becoming less important, resulting in more electrons exiting the trap. As Meyer notes, a process that becomes more probable with decreasing temperature, as cryogenic electron emission does, is very unusual in physics. Among his interesting observations are that the cryogenic emission rate does not depend on whether the device is cooling or warming up, but only on the current temperature. Overall, the properties of cryogenic electron emission don’t fit with any other known spontaneous emission process, including thermal emission, field emission, radioactivity, or penetrating radiation such as cosmic rays. For example, unlike the well-known thermionic and field emission processes, cryogenic emission doesn’t depend on the electric field at the emitting surface. At least for now, the phenomenon of cryogenic electron emission remains a mystery. He added that his next step will be investigating how universal the effect is. i read somewhere that we have gamma rays, and neutrinos going through us all the time, all day every day, trillions(?) of them, maybe those are making those electrons appear as they pass through the cryogenic environment? Since photomultiplier tubes are used in neutrino and muon detection experiments, it seems unlikely that neutrinos, muons or cosmic rays are causing this. WIMPs? MACHOs? or other proposed dark matter particles? That would be very interesting. Note that the burst data implies particles moving slowly with respect to the photomultiplier tube. To me it seems to be related to Bose Einstein condensates. At those temperatures, suddenly a cluster of atoms give off some energy to the surrounding atoms and this particular cluster becomes even colder locally. The cluster goes temporarily in condensation, and when they come out-of condensation, they emit the electrons. As with neutrinos and gammas one would not expect correlated bursts but singular emission events. This article is pretty fascinating as it hints at a new mechanism. Some sort of resonance phenomenon or local energy minimum that suddenly becomes overcrowded. In this experiment only a single photomultiplier was used since there is no point in 'taking a picture'. As the atoms in the material are chilled, they pull the electrons closer to the nucleus until the shell is filled. This process is repeated for all the atoms' shells until they're simply no more room to be occupied and the electrons are discarded (emitted). Higher bursts relate to higher electron shells. At even lower temperatures, the lower electron shells have already been filled, so you have a larger amount of electrons vying for both rare and weak (in binding energy) "holes". In these cases, large groups of electrons are at risk of being easily disturbed and discarded from rapid and "desperate" electron movement racing to fill those last remaining holes. Just one POV; as the article notes, the possibility for explanations are quite numerous because so many physical processes that overlap at these "extreme" reaches of physics. I think Meyer needs to get himself a few superconduction field friends and have a go at determining relation to cuprate transmission. Idea 1: As temperature decreases, the impact cross-sectional area of the nucleus increases. At some specific point, it exactly matches a resonance frequency of some ambient radiation (neutrinos cosmic rays) and absorbs energy from this impact. This might force negative beta decay, ejecting electrons. THIS IS TESTABLE: long duration OR low mass study - add sampling of chemical makeup of set of atoms undergoing this change. My 5 cents. -- Kevin Rice, Mundelein IL. Since photomultiplier tubes are used in neutrino and muon detection experiments, it seems unlikely that neutrinos, muons or cosmic rays are causing this.. There's a reason neutrino experiments are carried out far underground where the photomultipliers are shielded from cosmic rays. The original idea that cosmic rays might be playing a role is still valid. They just need to repeat the experiment in one of the underground laboratories. @skeptic_heretic: Yes. They say it is rare for the probability of an event to increase with decreasing temperature. Superconductivity seems to be one of those things. It would also be interesting to test the effect of magnetic fields on the process, as that might provide another link with superconductivity. Here's an idea: casimir effect. Discuss. "This article is pretty fascinating as it hints at a new mechanism. Some sort of resonance phenomenon or local energy minimum that suddenly becomes overcrowded. As in string theory? resonant freq's .. ?? I'ts such a relief to read of a data-driven experiment wherein the researcher is full of questions rather than preconceived answers! well i would like to say that this could possibly help for string theories, WIMPs, MACHOs, cosmic rays, and all those "extraordinary stuff"
A chain of events: absorption of an electron neutrino resulting in the stimulated emission of a burst photons which knock electrons from the valence band into the conduction band in the photomultiplier. Even at room temperature, the electrons are essentially filling the energy levels up the Fermi-level. This is basic Fermi-Dirac statistics. Given that, cooling the material will not reduce the energy of the electrons in any appreciable manner. You're both incorrect as you're both assuming that electrons have a position within the atomic structure. Electrons don't follow particulate behavior unless observed. The shell model is partially incorrect as it's depicted. Um... I didn't assume the shell model... Solids can be extremely well approximated by a lattice structure, and crystals, like those found in PHOTOMULTIPLIER TUBES, are almost perfectly approximated by such a lattice arrangement. And lattices have what, class? "A Fermi surface!" Very good! And you're still wrong! Electrons occupy all space and no space simultaneously within and outside of the structure of an atom. Understanding the HUP and it's derivatives is essential is exemplifying a point about advanced particle physics. Back to class for you, sir. You'll soon realize that Fermi surfaces are only applicable when speaking directly of metals and metaloids. Beyond that point organic and non lattice structural components must be spoken of correctly by wave attributes as opposed to Fermi-Dirac statistics. It's not something you'd learn in undergrad so I don't expect many to be fully familiar with it. Kudos to you on knowning what a Fermi Dirac Statistical matrix was. This is one of the most intriguing experiments I've read of in a long time. A metal is defined as nuclei in a sea of electrons. What happens to a Bose-Einstein Condensate is that a cluster of atoms in this state exhibit the characteristics of a single super-atom, ie. specifically by exhibiting a single deBroglie wave function. Granted, the conditions in this experiment are not that of a pure condensate, however, they are approaching that, so what if the net effect of this behaviour is that the electrons gain sufficient energy in this state by "crowding", to excite a few enough to leave the cathode? I think the next step in determining what is going on is to create something similar to a Moseley diagram by using cathodes of different elements. I accept your explanation Bloodoflame, with the electrons filling up to the Fermi levels, but they're out of phase with each other creating the so called electron "holes" on the multiple "shell" levels. The the temperature is lowered and the material begins to step in-phase, and the holes are forcefully filled and any out-of-phase electrons are expelled if they cannot find a home. Could this be in some way analogous to, or an actual example of the elusive "zero point field" energy? If it is- then we really would be speaking of energy from the void. Need to find a way to collect it on large-scale basis. Orbital voidenergy farms? I'm cracking myself up here, so go easy with the flames! No, he is not wrong, Fermi surfaces are applicable to metals, metalloids and doped semiconductors - all materials photo-cathodes are made of. So by adding doped smeiconductors, which are exclusively made of metals and metaloids you've shown me to be incorrect how? When speaking about dark emission he is not correct as non-metal/non-metaloid elements also produce dark emission effects. Fermi surface is not applicable to non-metals. So you can see why I didnt bring it up. Yeah-apparently, so far, it has flown below the proverbial radar. Or the doped semiconductor. Your reply makes no sense. First, there is a difference between being made of something and being something, water is made of two elements yet it is not an element, you are made of cells yet you are not a cell, etc. Second doped semiconductors are NOT made exclusively of metals and metaloids, one common dopant is phosphorus which is a nonmetal. As I said, photomultiplier cathodes are made of metals, metalloids or doped semiconductors and to all of them Fermi surface is applicable which makes your objection invalid. The claim that non-metal/non-metalloid/non-SC elements produce dark emission is your own invention, photocathodes are never made of such materials for obvious reasons. BE condensates are formed at temperatures of a few micro kelvins. At the experimental temps used, This is not a possible explanation. I am wondering if this is a quantum effect of some sort. The temps seem really high for quantum effects to manifest, but I am curious what the emission spectrum would look like using different substances and temps down to a few milli-kelvins. If this effect doesn't matter what substance is used, and the emission rates are very reproducible as the temp gets smaller, then a thermodynamic/quantum effect becomes much more likely. The answer is obvious, photomultipliers have free will, since they are a divine construct, created on this mortal plane to struggle for their eternal souls in the war between good and evil. Only at very cold temperatures though. The weird thing (to me at least) is that the system is being put in a _lower_ energy state (by cooling) and reacts with a _higher_ energy output. Let's say I put this thing into deep space (space being around 4K). Let this emission take place and use the free electrons to do some work (they are emitted so they have some impulse and could be caught by some solar array analog for electrons of that energy)...then feed them back into the system (the photomultiplier material). This sounds like a closed loop which can indefinitely do work??? Sounds like a perpetuum mobile. But that can't be, can it? ...unless, of course, this is some sort of radioactive decay reaction which just happens to be more likely at low temperatures (for whatever reason) - in which case we don't get a 'free lunch'. This might also explain the burst if the decay emits more than one electron there might be a very local chain reaction going on. I'll venture it again: possibly the "zero point energy"? That is why I suggest that a very small localized cluster of atoms transfers 'heat' to the surrounding atoms in a way that the local cluster diminishes temperature enough to go in and out of BE condensate. Wonder if, after some extended period of observation, this spontaneous emission of electrons begins to exhibit any pattern? 1) If the burst get less exponentially over time then that would indicate a decay/transformation process. Thanks for those ideas. It's most likely that some process we are aware of but have failed to identify is the cause. On the other hand- what if none of them explain the emissions? What if it is actual spontaneous electron emission? If I had the money, I would pay for the next trial just to know! My bet is on some possibly novel kind of quantum tunneling. (...)Sounds like a perpetuum mobile. But that can't be, can it? It's not a perpetuum mobile because you need to provide bias voltage for photomultipliers to work and it's voltage source which does all the work in the system. I'm not understanding the first graph. I'm probably missing something, since I'm not a scientist. The article states there is a transition at about 220 K where the electron emissions start to level-off. Then as the temperature is reduced further the emissions start to increase all the way down to 4 K.
Why does the X-axis show the temperature INCREASING from 0 to 300 K, instead of DECREASING from 300 K to 4 K? Could it be as simple as static electricity? It seems to me that the glass tube (I'm assuming a lot here so please bear with me), being immersed in liquid helium, could develop static charges along its surface that could migrate or collect in different areas. Then, like any charge that reaches a certain point, could discharge and emit a certain amount of electrons. This could be a very tiny amount on the micro scale. There must be some charge to the liquid (along with currents and eddies in the liquid near and around the glass envelope) that might be exchanged between the two. Or is this experiment 100% charge neutral? Again, please forgive my ignorance, just a thought and needed to say it. and small amplitude fluctuations are not damped as much. aka the "origin". The classic Cartesian coordinate system. If the graph is correctly labeled on the X-axis, with temperature decreasing going right to left, the start of leveling-off at 220 K is not correct. The graph starts to level-off at closer to 280 K, when T is decreasing right to left. Maybe the text of the article is wrong. But 220 K is not where this graph starts to level-off. Ok, the caption for the gragh says that at about 220 degrees, the emissions "level off", but apparently this levelling off is relatively short-lived as temp continues to decrease, before emissions again begin to increase. If the graph were enlarged, and the unit division subdivided once or twice, the transition would appear at greater resolution. As it is- the levelling off occurs at roughly the bend in the emission line. I see what you're saying, though- it does appear a little skewed. I think the level area is represented by the barely-discernible turquoise- colored segment. Yes, not to beat a dead horse....but clicking on the graph enlarges it enough to see the plot. Going by the turquoise squares, the emissions increase starting at 275 K and lower, right to left. Oh well, good enough. It's only science. LOL. Repeat experiment with a very small quantity of the material. Observe for prolonged period. Observe effect of electron depletion. Seems very closely related to Walter Russell's work. Walter is another case of mainstream science ridicule due to not understanding his specific points. This comes from a need to re-interpret the basics (the bigger the problem, the harder the answer is to find, the more fundamental the mistake in the formation of the question), which science periodically has to do in order to move forward. If someone wants to try and understand some of the current anomalies that exist in science, then taking hard and long look at Walter's work can reveal some great insights.